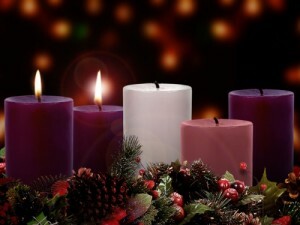 We light the candle of light and truth this coming Sunday on the Advent wreath. I find it interesting that it comes after the candle of hope and expectation. In some ways, I think hope and expectation is driven by visions of light and truth, not hope before the light. But it's not often that way. Many times, hope and expectation comes long before you have a glimmer of light and truth. John the Baptist did not yet see the light before he offered the waters of baptism, the hope of new life, to those who came. He acted and then saw the Light appear before him. The readings for this coming Sunday are from the his story. “You brood of vipers! Who warned you to flee from the coming wrath? Produce fruit in keeping with repentance. And do not think you can say to yourselves, ‘We have Abraham as our father.’ I tell you that out of these stones God can raise up children for Abraham. The ax is already at the root of the trees, and every tree that does not produce good fruit will be cut down and thrown into the fire. It's truly the fire and brimstone words you'd expect from a preacher out on the streets of any city. It's full of hope and at the same time warnings for those who don't repent. And this was before Jesus came up to him to be baptized. He had expectations and hope for something when in the midst of what he saw, he should not have had hope. To me, that's what makes the light and truth so powerful as the second candle. You don't yet see the light but you've lit the candle of hope. We must be able to hope first. We must act to be hopeful first. We must expect the coming of Christ first. After that, the light appears. 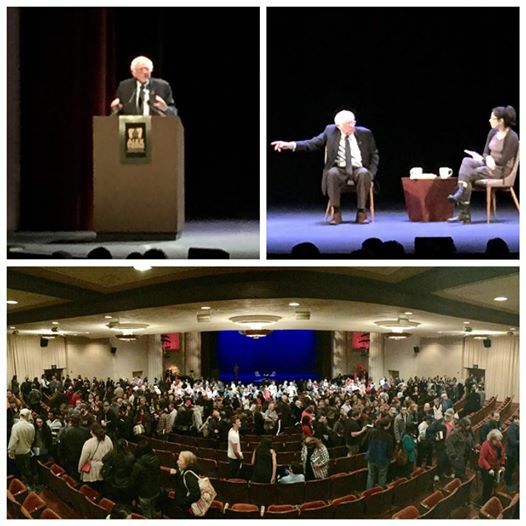 Last night, I saw Bernie Sander speak to a packed auditorium in Glendale California. An event sponsored by Vromans Bookstore of Pasadena, the talk was supposed to be at my church All Saints Pasadena but had to be relocated to a larger venue because of the high demand. Many in the crowd were Bernie supporters, many were curious about his message now after the election. And he spoke with us, with a short period of questions and answers hosted by comedian Sarah Silverman. And what did this Jewish Presidential candidate say when he spoke? I heard a message of Advent. I heard a message that said we must hope, we must act, and we must plan on seeing the light and truth shine eventually. I heard that together we can rid ourselves of the vipers that got us here. And I heard that to act, we must repent, acknowledge the concessions of our souls that yielded too much power, too much of our free will to personless entities lacking humanity, that finds it easier to scapegoat than to heal. As we approach this weekend, when we light the Advent candle of light, may we all lay the groundwork for the light that comes after today. Today we lit the first candle of the Advent wreath at church. Perhaps because evening comes so early now that daily savings time has ended and we've returned to normal lighting, it seems dark. Dreary. It actually got gray and rained a lot in Los Angeles this weekend, a somewhat surprising weather pattern for us during Thanksgiving weekend. And I was thankful for the rain, the clouds, the darkness. Because sometimes, it's hard to see that there is light around us if we don't have that darkness as a contrast. Now, don't get me wrong. I love the beautiful sunny days of Southern California and it's why my family moved here from the midwest in the late 70s and why I've stayed. But we sometimes take for granted all the light around us when we don't see it in stark contrast to darkness. I haven't posted much since early November, largely because I have been living in a cloud of darkness. I feel anxious and unsettled for our country given that my demographic profile doesn't conform with the current nativist, uncompassionate political climate. And I'm surprised and frankly disappointed that so many people who I care about are suddenly scared and frightened. "Really?" I think to myself, "How is it possible that people -- people that I know feel as I do -- can't see the bigotry, misogyny, and racism abounding in this country? Why does it take a political upheaval to make them realize what has been there all this time?" It's like not wanting to go into the horror of a mess in my storage in my basement, knowing what a nightmare I'll find, and thinking it's ok to just ignore it. Well it won't clean itself up unless we address it. And, if I'm honest with myself, it needs my participation to make it happen. Which is why that first candle of Advent means so much. It's the candle of Hope. With the first light, the light that starts the Advent season, we burst through the darkness and inspire something that wasn't there before. The candle didn't come of its own but was lit by someone, lit to create sight where there wasn't before. It's a game changer, if even just a flicker. I suffered from measles when I was a toddler back in the Philippines. I recall that extraordinary pain when my eyes opened to see light. There are very few memories of my childhood kicking around in my brain, but I do recall this one. I remember it being night but I had my eyes closed from the pain. My mother was talking to what I now know was the doctor. During that conversation, the doctor was asking me questions. After a few questions, the doctor said that he was going to stand on the other side of the room and tell me to open my eyes. Then he asked me to open my eyes. And I shrieked in pain like I never have screamed ever since (well at least until this spring on the Camino). I quickly shut my eyes again because the doctor, from the other side of the room, had lit a match. And that little bit of light was all that was needed to cause me incredible pain. That's what happens for many who suffer from measles. Light sensitivity is profoundly painful. But it's that sensitivity that I think we are needing right now. We're wandering in the darkness, yearning for light. And when that light, that hope, that spark finds us, we will be blown down in pain and fear, shock and awe. We know it's coming, we await it's coming, we want it to come. But it's not going to come without some bitter pain, at least at first. And we await during this penitential season for Christmas to come. Yes, I am one who enjoys Advent for the season it was meant to be. Like Lent, it's a time for reflection and penitence, where we await the Good News that has been foretold. I'm thinking that we as a country are going through a penitential time, a time of waiting, of fearing, of awe-filled hope. We're in our Advent, when we prune back the deadwood for the coming spring and new life that will come. Within our darkest night, you kindle the fire that never dies away, never dies away. You can hear the song on YouTube: "Within Our Darkest Night". I sang it over and over during the darkest times of my divorce 10 years ago. Ten years. It seems like a lifetime since that time of immeasurable darkness. And yet the pain and depression was so profound that I placed myself repeatedly in irrational situations, hoping that my external world would crash down as intensely as my internal world. I was deeply hurt back then, so hurt that I'm still dealing with it. And ... I'm also still growing from it. Because the fire never died away, never died away. It shone, if even painfully, in the bleakness, painfully shining on my sores. I'm not sure how I arose from those ashes, but I did. I know that I didn't sit still. I attended services, though they were the contemplative ones, not the typical liturgical ones in the Episcopal church. I spoke with others who had experienced similar pains. I let myself cry. I gave myself time and room to cry. And that's the active part of the light in the darkness. We don't just feel hopeful. Hope is not just a noun but an active verb. Diana Butler Bass (in her Thanksgiving prayer) and Rev. Susan Russell of All Saints Episcopal Church in Pasadena (in her sermon today) both talked about choosing hope. That you have to choose to hope and not just feel hope. I agree and more. You have to hope to be hopeful. You may not feel like hoping, but that's what you must do to survive the sometimes existential emotional difficulties of penitential seasons of reflection. You have to hope to be hopeful, just like you need to exercise if you want to be fit or rehearse if you want to sing well. It takes practice. We must act in order to hope because it is in action that we swim across the riptide current that takes us under. It certainly isn't pretty or tidy or comfortable at first, or even for a long time. But with practice and conviction, you'll reach a level of hopefulness that you might never have anticipated or believed. In closing, at the top of this reflection, there's a painting from Henry Ossawa Tanner that hangs in Philadelphia. It's one my favorite art pieces. 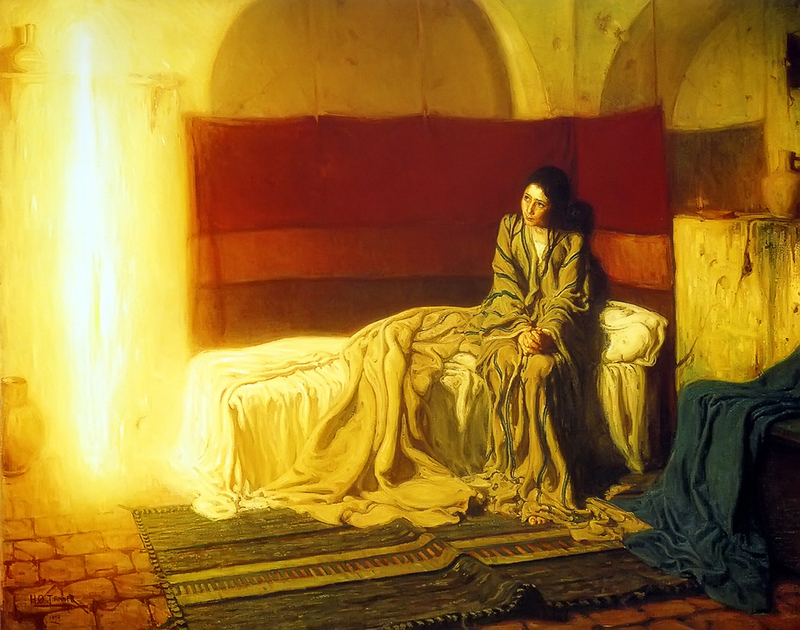 "The Annunciation" (1898) depicts the angel Gabriel appearing before Mary. In it, you see Mary's simple yet deeply moving body language, implanting her deeply personal reaction into our own psyche. James Romaine commented that "Through the visual language of her pose and expression Tanner draws the viewer into Mary’s inner life of virtue, trepidation, acceptance, and wonderment." (Art as Spiritual Perception, 2012). I connect with Mary in this painting because, though I certainly don't share in her virtue, I too feel her trepidation, acceptance, and wonderment. And if you don't know who he is, Tanner was the first African-American artist to achieve international acclaim in his day. One of his paintings hangs in the White House, the first painting by an African-American ever to be installed in that building, by a President from a town called Hope. Hope is like that. It isn't a merely feel-good action. It's not passive. It fills us with pain and trepidation, acceptance and wonderment. And as Christians, it's what we are doing when we're asked to do the one thing commanded of us: to love one another. Hope is the verb and noun that embodies true love. We may not feel it. But we have been asked to do so. And, we are committed to hope. So join me in the act of hope. As All Saints' Day and All Souls Day arrive, I start to think about the blessings all around us, the cloud of witnesses who came and laid down the pavement for us to walk upon but are no longer physically present. And it seems fitting that the readings this coming All Saints' Day (November 1) are the beatitudes as laid down in Luke 6:20-31. It's slightly different from the beatitudes of Matthew 5:3-12. In comparison, here's the one in Matthew. It seems that the reading for today is focused more heavily on those who are truly poor and the one in Matthew focuses on the ones who are poor in spirit. They are both in the Gospel and I am inclined to think that both are equally important for us to ponder. In many ways, I conflate the two and think Christ was focused on all the poor in society, body, and spirit. Perhaps because I've spent my career in software, I thought I would revisit this list and made some changes. I do this not because some things are less blessed than others but because sometimes, with the filter of time, you start to see things differently. I put in italics the areas that changed. In your world, what are YOUR beatitudes? And in your heart, who do you bless as Jesus would bless?